﻿Lisa Jewell, originally from Ontario, has been living in Tofino on Vancouver Island for the past 7 years. You may have seen her at the Tofino Public Market selling her one-of-a-kind jackets. Lisa first began experimenting with a sewing machine that was handed down to her about 10 years ago. Through trial and error, and do-it-yourself books, she first experimented in quilt-making. She recalls her love of thrift store shopping as a child with her mother. At a young age she began collecting unique bits and pieces of vintage fabrics, brooches, jewelry, and antiques. Today she is still most inspired by these same rare finds and incorporates them into her hand made creations. Lisa is excited by the enormous amounts of quality fabrics available that can be re-used and re-created, into new and interesting works of art. Although Lisa is best know for her dazzling jackets, she is currently embarking on some new textile pieces which she hopes to have completed for the upcoming P.R.A.S. Art Show. In Tofino Lisa Jewell's work is on display at Enchanted. She also participates in the Tofino Artist Studio Tour. 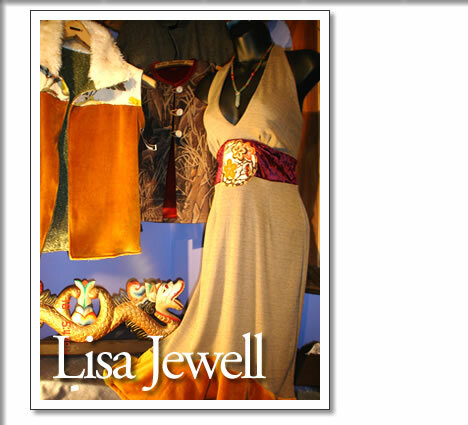 Tofino artist Lisa Jewell creates her works from textiles. Her creations can be found at the Tofino Public Market and she participates in the Tofino Artist Studio Tour.